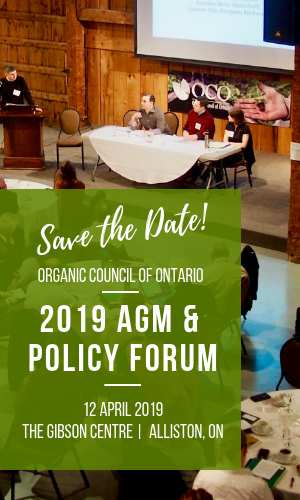 Despite freezing rain and road closures, the intrepid members of the Organic Council of Ontario showed up to the Guelph Arboretum on March 24th ready to engage in active debate and discussion. The day began with a welcome from the President and Chair of the Organic Council, Tom Manley, with a clear message that the Organic Council of Ontario will be more focused on serving members in the area of business, economic and regulatory affairs going forward. Carolyn Young then demonstrated the potential of sector fundraising by providing insight into how much funding is generated in other jurisdictions such as at Prairie Organic Development Fund and the Organic Grain .50 fee in Quebec, and how much the organic sector provides to other commodity groups in fees and levees. 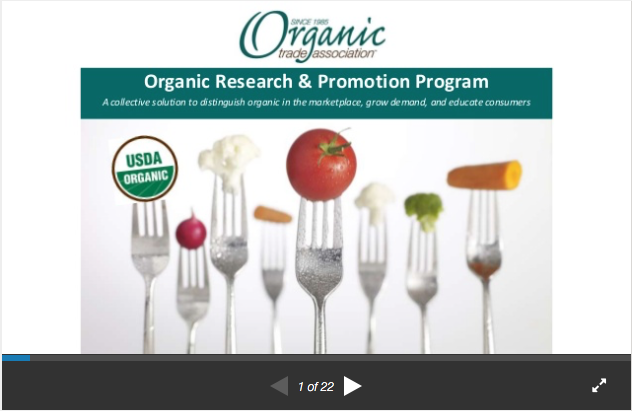 Our guest speaker, Marni Karlin, though unable to attend in person, skyped into the meeting and spoke to the audience directly about the development of the US GRO Organic check off. 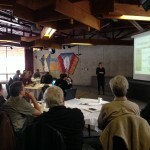 The group then heard from companies participating in OCO’s voluntary production contribution program. 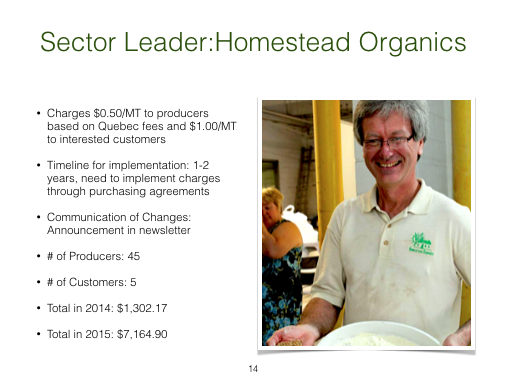 Tom Manley of Homestead Organics described how in 2014, he implemented a fee of .50/t of grain in purchasing agreements with his growers and matched that contribution before providing it to OCO. He also solicited customers in both Ontario and elsewhere to join the program by contributing $1.00/t of grain. So far, Homestead Organics is generating approx. $7000/annually for the sector. 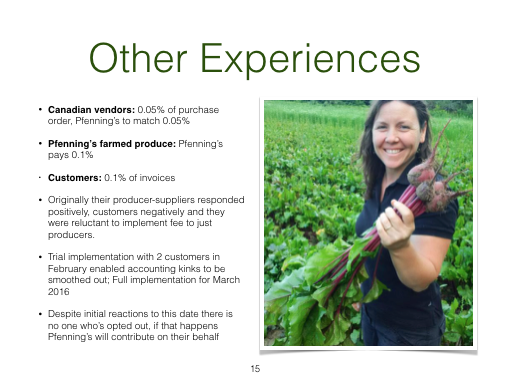 Pfenning’s Organic Vegetables described their new program as well in which they request a contribution of 0.05% of every invoice from their suppliers and match it. They are also requesting a contribution of 0.1% from some of their customers. This is a new program and they are fielding questions and working through kinks together with OCO, but so far it is a promising start.Small group discussions raised many further hopes, questions and concerns about the idea of an Ontario organic check off. These thoughts were reported back to the group and a summary is provided below. 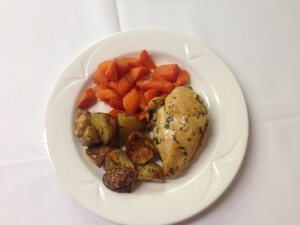 Lunch was generously donated by Pfenning’s, Yorkshire Valley Farms and Organic Meadows and we thank the University of Guelph catering department for going above and beyond to work with these suppliers. Following lunch, board Director Ted Zettel reminded the group of the importance of staying abreast of changes in the Canadian Organic Standards. 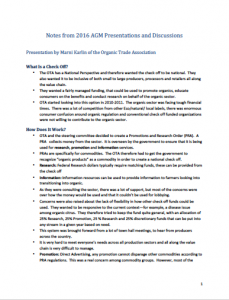 He encouraged people to view the webinar interviews on the Organic Federation of Canada’s website that highlight the main changes that producers should be aware of why they were proposed. Ted also reminded farmers how important their voices are in the development and interpretation of the standards since they deal with the realities of the regulations. He is currently the chair of the Organic Standards Interpretation Committee and would love for other farmers to join him! Following Ted’s update, Carolyn Young and Tom Manley led a discussion on the creation of an Ontario Organic Intra-provincial Regulation. Some research conducted by Maureen Bostock and Tony McQuail was presented to the group and small group discussions followed. 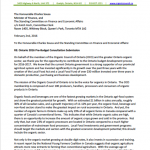 There was unanimous interest in seeing an Ontario regulation put in place, but less consensus on whether or not to create a small-scale program and/or exemption. 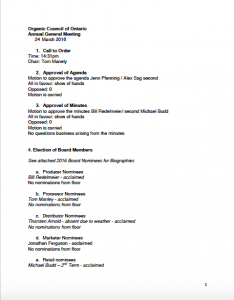 The Business Meeting followed these discussions and the proceedings are recorded in the minutes below. 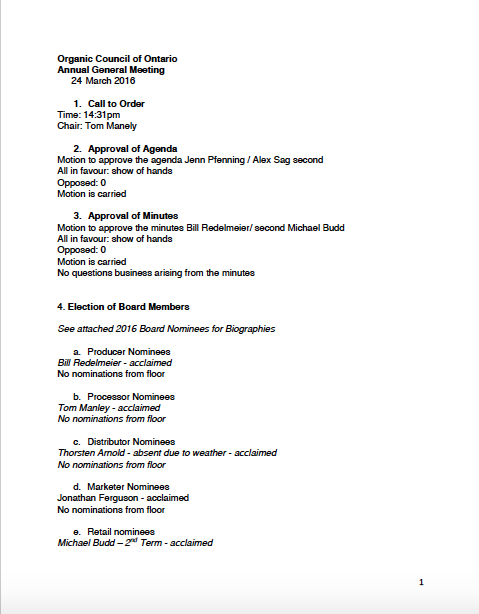 Highlights include a discussion on financial situation of OCO; finding a new, more affordable auditor; and the election of new board members. 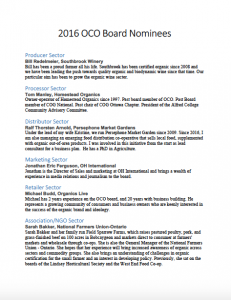 We now have a full board slate with representation from the full value chain and geographic diversity of Ontario. Thank you to Ted Zettel, Hugh Martin, Jacob Pries and Jenn Pfenning for their contributions to the board over the past two years!